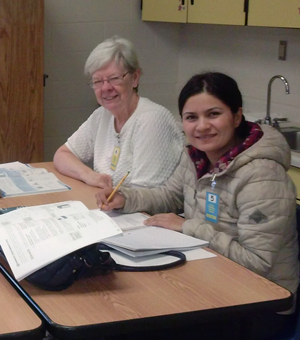 This is my fourth school year volunteering in the adult ESL class in Big Lake. After retiring and moving to Minnesota I wanted to find a volunteer job to fill part of my time. When I saw an ad in a school bulletin for volunteers in adult education, I applied, attended the required class for new volunteers, and began work in the fall of 2012. Tuesday and Thursday mornings and Wednesday afternoons usually finds me in the classroom. I’m a math tutor for those working toward their GED and/or students learning English grammar and conversation skills. My previous experience in speech therapy helps in tutoring enunciation of sounds and words. I use modelling the sounds, writing the sounds phonetically on paper, and sometimes using a mirror for them to see how they are moving their articulators. This gives them aural and visual cues in their efforts. One small example of writing phonetically is the word “Culture.” I wrote the word both as culture and as “culchure underlining the “t” and “ch.” The “v” sound can be difficult, so looking in a mirror helps. Practicing conversational English helps the students deepen their ability in English and it enriches my life with learning more of other cultures. Math has always been a love of mine and I know it takes patience and perseverance for students to accomplish their goals in math. They struggle with many of the concepts, working with fractions, applying the Pythagorean theorem, and understanding and remembering how to add, subtract, etc., negative numbers in algebra. I try to break down processes as simply as necessary for understanding and give the students many worksheets because it often takes a lot of practice to really understand and remember the processes. They need lots of encouragement that with practice they WILL get it. This volunteer activity is very rewarding. The focus of the students on their lessons and their dedication to the learning process is wonderful to see. After every session they show their appreciation by saying “thanks.” They also show their appreciation in other ways. After learning good enunciation a student will come back the next time, say the word, and tell me that they practiced at home in front of a mirror. When students “get it” in math and understand a concept, it is truly an “aha” moment for both of us. Literacy is so important for anyone to function well in society and I am happy to participate in these goals. Encouraging, Patient, and Pragmatic. Those three words describe Phyllis’ work with adult students and her outstanding commitment to helping them reach their goals. Thank you, Phyllis, for being a leader in the literacy community!